Khalida Jarrar has been subject to Israeli harassment before, and it is widely believed that her arrest this month is due to her effective advocacy for Palestinian rights in light of Palestine’s recent accession to the International Criminal Court (ICC). 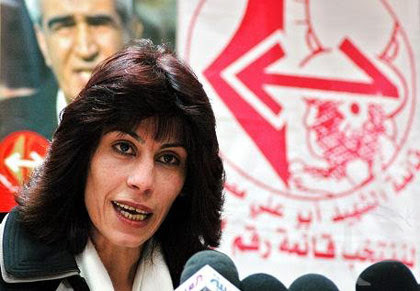 On April 2, 2015 at 1:30 am, Israeli Occupation Forces arrested 52-year-old Palestinian feminist parliamentarian Khalida Jarrar from her home in Ramallah. She was questioned for four hours at Ofer Detention Center in the West Bank, and then transferred to HaSharon Prison in Israel. Khalida Jarrar, who has long been an outspoken critic of Israel’s occupation and a leader in the struggle for Palestinian rights, has been sentenced to 6-months “administrative detention”—this means she is being held without charge and without trial, and her detention can be extended indefinitely. In addition to the patent injustice and illegality of this sentencing, there is widespread concern about her detention because of her health needs—she has suffered a series of strokes and has high blood pressure, and requires medication and monitoring for both conditions. You can read more about Khalida Jarrar’s case on the web site of Samidoun, a network of North American-based Palestine solidarity organizers and activists. Her case has also been taken up by Amnesty International and other human rights groups. Please support Khalida Jarrar by taking one or more of the below actions. 1) If you have two minutes, you can go to the Samidoun website to send a letter to Prime Minister Netanyahu and Brigadier General Efroni. 2) If you have five minutes, you can write a letter or post card to Khalida Jarrar. While Israeli authorities often deny Palestinian prisoners access to their mail, your letters will show Khalida’s jailers that the world is watching. (N.B. : Postage for an international letter from the U.S. to Israel is $1.15). I hope this letter reaches you in your prison cell in Israel. I join other people of conscience around the world who are appalled by your detention without charge or trial at the order of the Israeli military commander in the Occupied West Bank. I believe your administrative detention is an attack on political expression and a means of preventing your political activism on behalf of the Palestinian people. Thank you for your outspoken advocacy on behalf of dignity, equality and justice. 3) As part of a long-term commitment, join the BDS (boycott, divestment and sanctions movement) in support of Palestinian rights. Please also check out CODEPINK’s vibrant and effective boycott campaigns.